Well this post is about layered architecture , which organize your project into 3 or more disjunvtive layers. 3 layered architecture is a very well know buzz word in the world of software development whether it web based or desktop based. 1. To make your application more understandable. 2. Easy to maintain, easy to modify application and we can maintain good look of architecture. 3. If we use this 3-Tier application we can maintain our application in consistency manner. Now lets understand these 3 layers and their working . It is the Very first layer also called as user interface layer. Basically it is the layer on which end user works. for example : Registration form , any home page of website. Scripts (client side java scripts), Styles (css and custom styles for styling the page), Master Page (.master extension, for providing common functionality to group of desired pages, Configuration Files like web.config and app.config etc.). 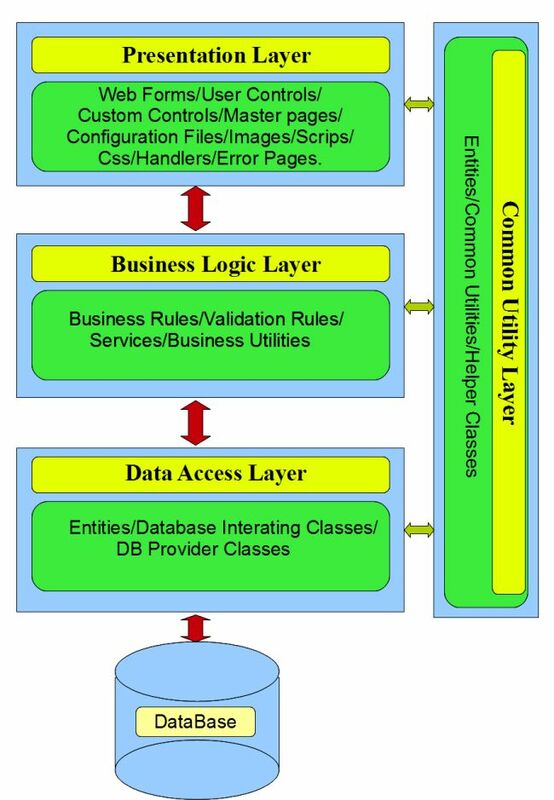 BUSINESS LOGIC LAYER: For validating the data as per the rule for the business. It works as a real world object. All the functionality is defined in this class and used to display the details in the Presentation Layer. It is a bridge between Data Access layer and Presentation Layer. It reduces the validation check to the Database server. So Database does not get overloaded.